Ease into spring with this cool slate and petal pink color combo. Your bridesmaids will adore this LOVE by Enzoani gray, chiffon gown found at the Bridal Boutique in Lewisville and Bella Bridesmaid in Dallas. This strapless, flowy dress will keep them comfortable and dancing all night long! This cake, from Crème de la Crème, is a delicious way to add just a touch of precious pink. Tie in the pink details with sweet and simple invites like these from Simply Personal. We love how the intricate, scroll stationary design mimics the cake! Choose pink and white blooms to complete this fairy-tale look. This bouquet, from Cebolla Fine Flowers, will warm up icy gray hues. It’s all about the details when it comes to place settings. 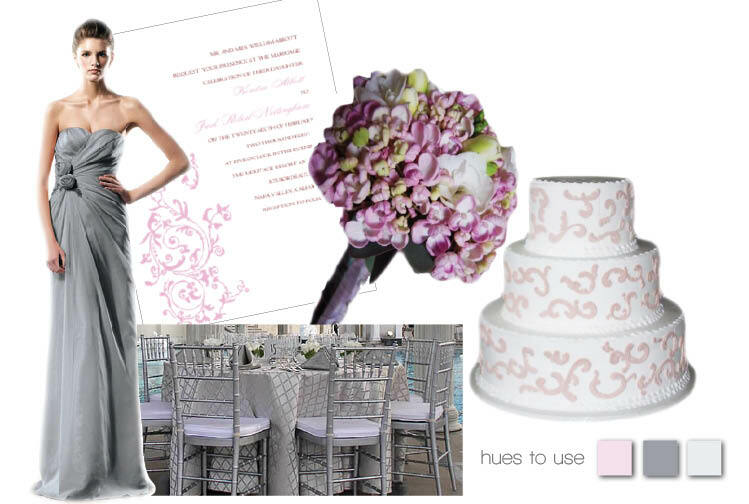 Dress your reception in a fabulous, monochromatic gray theme, like this one from BBJ Linen. Enjoy!